Exchange vows in a spacious ballroom featuring elegant, western-inspired décor. Whether you’re planning a large wedding or an intimate ceremony, the Y.O. Ranch Hotel & Conference Center offers more than 11,000 square feet of flexible event space. Dazzle your guests by reserving our Live Oak Ballroom, which can accommodate up to 600 people and declare your love beneath the soft glow of ornate chandeliers. 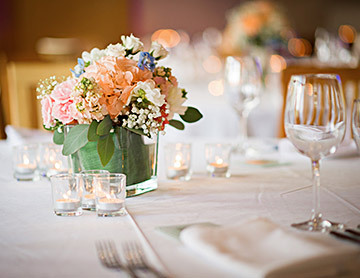 Allow expert caterers to create sumptuous banquets or brunches for your wedding. Plus, our talented planning staff will take care of all the details so you can spend more time with family and friends. Contact Tabitha for more information on how you can host an enchanting wedding! Use our toll-free number for inquiries (877) 967-3767.